/ Emirates Airlines First Class + Jeremy Clarkson: really a game changer? 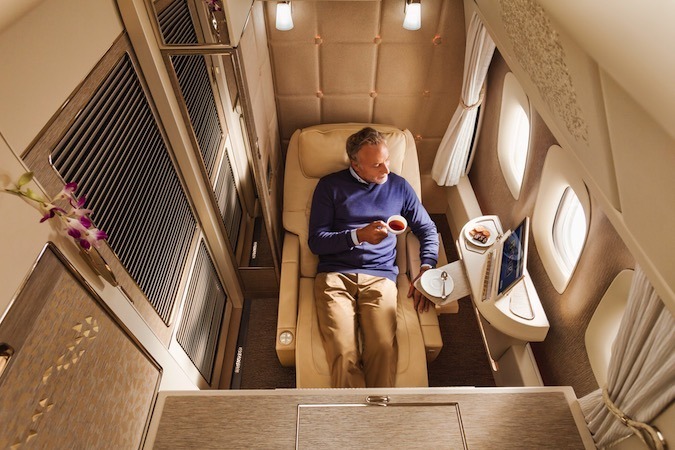 Is the New Emirates Airlines First Class + Jeremy Clarkson a game changer? By anyone’s measure, Emirates needs some good news for a change. But is the heady combination of Emirates Airlines First Class, Mercedes Benz and Jeremy Clarkson a masterstroke or desperate? Emirates Airlines First Class: a game changer? Business Class and Economy Class have also had an overhaul. New leather lie-flat seats in Business and leather headrests in Economy. But is the new Emirates Airlines First Class a ‘gamechanger’? Emirates also announced a new publicity campaign with Jeremy Clarkson and the branding ‘gamechanger’. Although he’s a very divisive figure, and it speaks volumes about what Emirates is looking for – attention. Like him or not, Jeremy Clarkson certainly catches attention, but it also smacks of desperation. Perhaps Emirates is targeting British expats and tourists who have been flying with different carriers since Emirates got ‘too expensive’ whilst also dropping lounge access and charging fees such as seat charges? Emirates certainly have their work cut out, with profits falling at record levels. I think it’s even more likely Premium Economy will be rolled out in the next 12-18 months. Emirates recently announced First Class is being removed from one of the daily Dubai to London flights. it’s even more likely Premium Economy will be rolled out in the next 12-18 months. It’s still far easier to redeem for the Etihad A380 First Class apartment, and at far better value too. Other airlines – especially Singapore – have excellent First Class Suites. Personally, I’m biased towards the Airbus A380 against the Boeing 777, as I feel it’s just a better all-round experience. Emirates have always favoured the 777, which is perhaps why they’re lining up the 787 rather than more 380s. Bottom line – whilst Emirates Airlines First Class may not be a game changer, I still want I to try it. The future – Emirates and Fly Dubai? To me, the gamechanger is likely to be the relationship between Emirates and Fly Dubai. Emirates’s business model seems to be focussed on using Dubai as a hub to connect long-haul passengers, primarily from Asia. European and American travellers can fly for better value – both cash and award flights – on other airlines than Emirates. Which is why the codesharing arrangement with Fly Dubai seems to be the real gamechanger. Dubai residents are looking for more value on their flights, and drifting away from Emirates – so Fly Dubai is a natural alternative. European and American travellers can fly for better value on other airlines than Emirates. Presumably many ex and current Emirates passengers will be keeping a close eye on Fly Dubai. Do you plan on flying Emirates Airlines First Class soon? Will you be trying the new Boeing 777 suites? We’d love to hear your thoughts by joining in the conversation in the comments below.